We were not, as a whole, a particularly religious family. There is no tradition of revivals. No great awakenings. No soaring sermons that come to mind when The Legal Genealogist thinks back to Easters past. The nearest church to my grandparents’ Virginia farm was a Methodist chapel. I don’t recall ever having attended a single service there except for the funerals of my grandparents a quarter century apart. Maybe it was because there were too many disparate faiths — too many Lutherans and Catholics who married into the Baptists and Methodists. 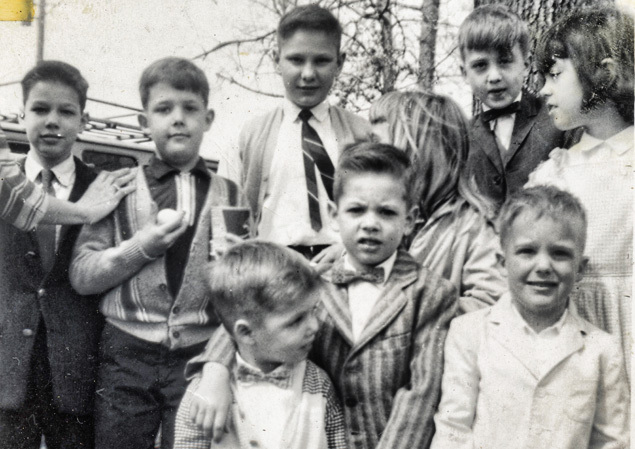 Maybe it was because there were too many people — cousins by the dozens is a good way to think of my mother’s family. Whatever the reason, we didn’t have the traditions so many people are writing about this weekend: the quiet reflections of Good Friday, the midnight masses, the Easter sunrise services, the triumphant organ music of Sunday morning. 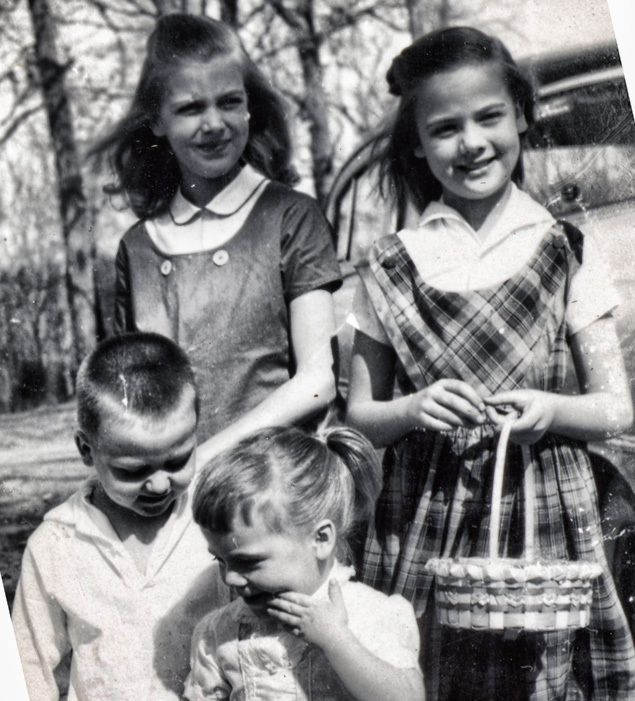 No, what I remember of Easter morning, from the years when I was a child and my family could make it to Virginia, to the Farm (in capital letters), for Easter, was The Hunt. Sometime before the kids were up and dressed — or at least before we were allowed out of the house — the adults would go to one of two pastures and hide Easter eggs and candy for us to find. I remember that we usually had to dress up, even though as often as not the fields were muddy or wet. I remember that the older kids were supposed to help the younger kids … or at least not muscle the littler ones out of the way when making a beeline for a particularly attractive egg. 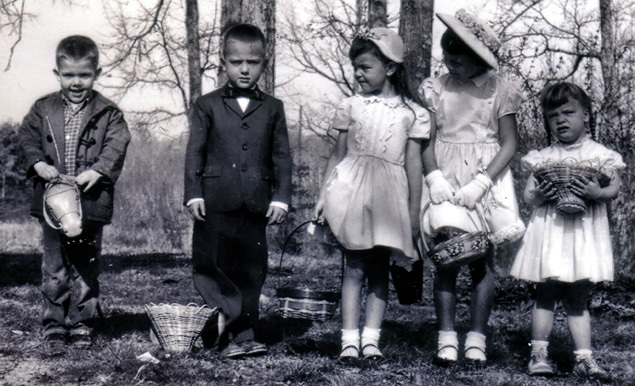 I remember that, somehow, the number of eggs and the amount of candy seemed to even out among the cousins, older and younger — a feat I suspect had a great deal to do with the number of adults pointing the way for the younger cousins. These photos are priceless, Judy!! Happy Easter! Thanks, Mary Ann — and happy Easter to you and yours as well! 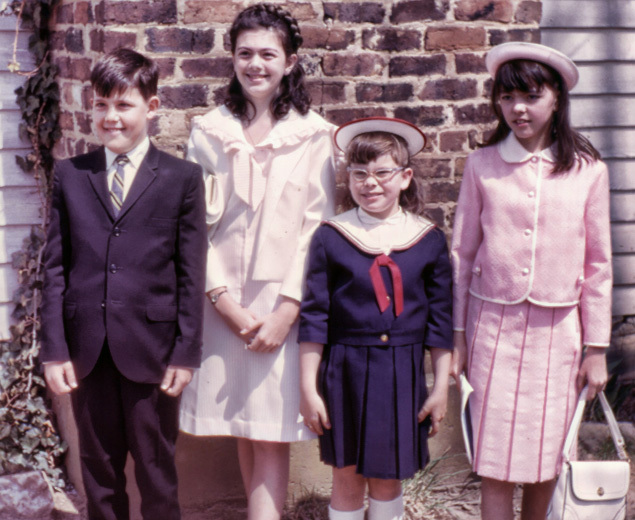 I had a favorite skirt suit in blue and glasses like Susan in the last picture….a happy memory for me, too! We all had outfits like that at one time or another, didn’t we? I never went to an Easter egg hunt…but it always sounded like so much fun! Perhaps it was because I was an only child, My Mom’s brother Bobby had two daughters who lived in New Jersey, and her brother David had children, but was divorced. My Dad’s brother had two girls, and when we were very young we all met at Grandma & Grandpa Newton’s house in Homer, New York. I have some black and white pics from my Uncle David’s Kodak Brownie camera of us dying Easter eggs at the dining room table one year. I also have a memory of going to my maternal grandmother’s apartment one year after my grandfather had died. She hid a plastic rabbit pulling a plastic wagon full of candy, and had hidden it under the end table in the living room. We didn’t usually go to church on Easter Sunday because we were usually at one of the grandmother’s, but we went on Palm Sunday to the Methodist church and received our palm fronds…and we took communion on Maundy Thursday. When I chatted with my Mom on the phone this afternoon, she reminded me of how her Orthodox Jewish daddy would always give me a new bonnet and white gloves for Easter when I was a little girl. And I remember receiving those sugar eggs that have a scene inside from my Dad’s Mom. The memories were only of about five years of my life because by that time, both my Mom’s Dad and my Dad’s Mom had passed away. Things were a lot different after that. Sounds like you have sweet memories too, Debra. I also remember the whole “new outfit” shopping expeditions. In looking at the pictures now, I marvel how the Moms got us all together looking so smart. I loved reading your Easter memeories. I seem to recall threats of mayhem if we didn’t keep the clothes neat and clean at least until the photos were taken!